The Best Low Carb blogs from thousands of top Low Carb blogs in our index using search and social metrics. Data will be refreshed once a week. Also check out Low Carb Youtube Channels. 2.6 TravelingLowCarb | Easy Ways to Lose Weight On-the-Go! 2.33 Queen Keto - Easy Ketogenic recipes, Sugar free, Low carb, High fat, Always delicious. 2.46 Low Carb Confidential | The World's Worst Low Carb Dieter. Low Carb newsletter is a comprehensive summary of the day's most important blog posts and news articles from the best Low Carb websites on the web, and delivered to your email inbox each morning. To subscribe, simply provide us with your email address. 6. TravelingLowCarb | Easy Ways to Lose Weight On-the-Go! About Blog Your Lighter Side caters to lower carber, healthy eating, funny, friendly folks! Facebook fans 74,373. Twitter followers 1,226. Facebook fans 154,051. Twitter followers 11,920. Auckland, New Zealand About Blog Ditch The Carbs is a low-carb recipe site packed with incredibly simple ideas to make giving up sugar, carbs and wheat easy peasy. All my recipes are sugar free, gluten free, grain free and low carb. Facebook fans 305,854. Twitter followers 21,545. Calgary, AB About Blog Low-carb, paleo and keto recipes plus free ketogenic videos to live a liberated life on a ketogenic diet. Facebook fans 68,482. Twitter followers 20,839. Brisbane, Queensland About Blog Ever wanted to eat fat whilst losing weight? Weight loss can be easily achieved with a these fantastic keto recipes. The best part, low carb tastes great! Facebook fans 133,978. Twitter followers 173. About Blog WickedStuffed is a collection of tasty keto recipes, plus tips and tricks for ketogenic newbies! Facebook fans 7,261. Twitter followers 3,230. Austin, TX About Blog Ketogenic diet and lifestyle information, motivation, and education. Living the high fat, low carb life is the healthiest way to live. Ketovangelist makes it fun, too. Facebook fans 20,722. Twitter followers 2,036. Pittsburgh, PA About Blog No Bun Please is a food blog that emphasizes ingredients that are gluten-free and low - carb. Follow for recipes, articles, freebies and more. A collection of high fat recipes that are perfect for a Keto or LCHF diet. Facebook fans 23,611. Twitter followers 406. Barbados About Blog Low carb and gluten free food does not have to be complicated! Welcome to my many recipes. Facebook fans 12,133. Twitter followers 881. About Blog Are you looking for the best low-carb high protein recipes? Here you'll find Easy, Low Carb recipes straight from the kitchen for you to enjoy. Facebook fans 10,595. Twitter followers 3,864. About Blog This blog will serve as a way to provide delicious low-maintenance recipes and how to make and eat healthy low carb food. Facebook fans 5,917. Twitter followers 372. Canada About Blog The Fit Housewife. I want to share my success story with you. I want to share how I exercise and eat right. I want to share our family’s favorite healthy recipes so that you can feed your family healthy food as well as give yourself the body you deserve…all without sacrificing flavor! Facebook fans 29,532. Twitter followers 1,294. About Blog Resolution Eats is a blog about pop culture and low carb foods. I'm a graphic designer and mother of two awesome kids. I'm also a Type 1 diabetic, and my New Year's resolution is to cut out sugar and switch to a low-carb diet. I'll be trying out different recipes and posting the good ones that I find. I'll also be posting kid stuff, just because it's fun. Northern VA, USA About Blog A source of sanity in the sea of nutritional madness. A Paleo, Primal, low-carb, & WAPF-friendly REAL FOOD nutritionist. Facebook fans 1,912. Twitter followers 9,492. 33. Queen Keto - Easy Ketogenic recipes, Sugar free, Low carb, High fat, Always delicious. About Blog Ditch the carbs and discover clean eating, low carb, sugar free recipes for the ketogenic diet. Delicious savoury dishes and sweet treats the keto way. Facebook fans 842. Twitter followers 2. About Blog Easy and family friendly Low Carb Recipes that will make you drool. Signup for email updates and get free low carb success guide. Facebook fans 11,782. Twitter followers 247. About Blog Low-carb blog: In-depth guides, tips, advice, food, and recipes. Maxhütte-Haidhof, Bayern About Blog Salala.de was created by chance. Vroni likes to bake for your life, even long before Low Carb and I, Nico, wanted to cook as a teenager - I thought. An internship in a star kitchen has shown me that I want to cook, but not become a chef. Not a profession for daddy's youngest. Facebook fans 4,521. Twitter followers 159.
marina del rey, ca About Blog Blog by a single mom who lives a ketogenic lifestyle and love sharing keto recipes and tips on how to live a low carb high fat life. About Blog Carb Manager is the easiest way to manage your low carb diet. Select from over 600,000 verified foods to track carbohydrates, calories, and more. Facebook fans 26,535. Twitter followers n/a. Vienna, Austria About Blog Low Carb Cooking Baking Living lowcarb-nocarb is a website with recipes in 3 languages (english, german, slovak) to help everyone who is interested in joining us in this lifestyle. Facebook fans 9,773. Twitter followers 1,361. Fargo, ND About Blog The low carb diet for the poor man. Cheap, easy, and fast. Facebook fans 5,745. Twitter followers 2,373. 46. Low Carb Confidential | The World's Worst Low Carb Dieter. About Blog I have written a lot on my experiences with low carb and plan to post these as articles in bits and pieces. About Blog Linda's Low Carb Menus & Recipes blog. International About Blog Making Your Lowcarb Life Better. Our motivation is to help you become as healthy as you can possibly be by providing the most up to date natural LC health information and resources available. Facebook fans 12,354. Twitter followers 2,938. Norrköping About Blog I started a Swedish site in September 2011 to prove to people that it is possible to eat good varied food even if you do eat low or no carbs. About Blog A blog about running and the low carb high fat diet. Including practical advice and experience of successful endurance running fueled by fat. About Blog In 2006 and 2007, I lost 85 pounds on a low carbohydrate diet. For a while, I experimented with carb-cycling. Under both plans, I lost substantial weight. While you are here, check out my recipe list on the right side of the screen. About Blog The Happy Healing Life, a website offering information about healing & eating for creating happiness, health, & prosperity, from a Type 1 Diabetic. Facebook fans 88. Twitter followers 94. About - We are a small band of diabetics all low carbers. Posting links to diabetes related articles and low carb food advice. In our spare time we like to lampoon the spreaders of fear and misinformation. Welcome to the crazy world of diabetes. About - I currently live in the UK. I hold a degree in Economics and worked in auditing, but I have always been passionate about nutrition and healthy living. I love food, science, photography and creating new recipes and I am a firm believer in low-carb living and regular exercise. As a science geek, I base my views on valid research and I have first-hand experience of what it is to be on a low-carb diet. About - Hello, I'm Katrin! I love living in London, dreaming about Ibiza and creating tasty and simple recipes without added sugar. All my dishes are low carb, gluten free and use natural ingredients. About - Low-Carb Recipes, Tips, Motivation. low-carb principles to maintain your weight and stay healthy. Provide information about right multivitamin for a low carb diet, and how low carb diets work. 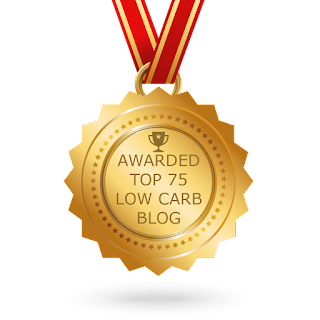 CONGRATULATIONS to every blogger that has made this Top Low Carb Blogs list! This is the most comprehensive list of best Low Carb blogs on the internet and I’m honoured to have you as part of this! I personally give you a high-five and want to thank you for your contribution to this world.